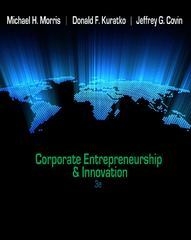 Corporate Entrepreneurship & Innovation 3 Edition This innovative book will be a useful and trusted reference throughout your career, no matter which company or industry you work within. CORPORATE ENTREPRENEURSHIP & INNOVATION is a one-of-a-kind book for the emerging business arena of entrepreneurship and innovation. Built on years of research and experience, the book employs a clear and informative how-to approach and features sections and chapters organized according to a summary model of the corporate entrepreneurship process. This groundbreaking book fulfills a real business need, because many executives consider entrepreneurial behavior a key to sustaining their companies' competitive advantage, but few possess genuine knowledge of the subject or understand how to apply it. The Third Edition of CORPORATE ENTREPRENEURSHIP & INNOVATION provides detailed, actionable answers to the "what," "how," "where," and "who" questions surrounding corporate entrepreneurship, giving you the knowledge and skills to take a leadership role in today's dynamic business environment.